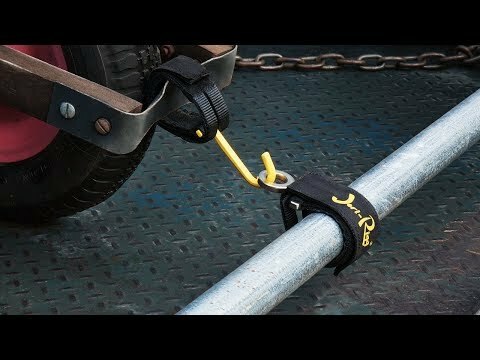 Set up this rugged anchor attachment in seconds by securing it to almost anything. 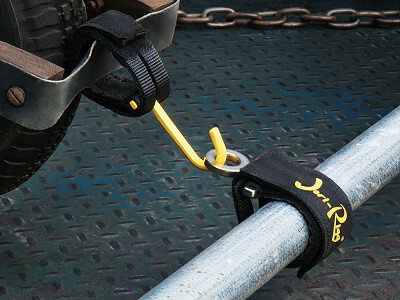 The Jeri-Rigg can hold up to 3,000 pounds, and it helps with day-to-day lifting, securing, and organizing. Transport a motorcycle in a truck or hang a bike in the garage. Or use its heavy-duty design to organize equipment or hang buckets as a jobsite companion. 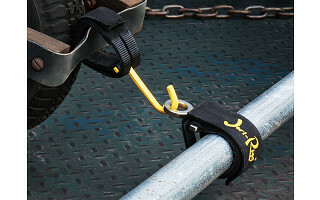 The Jeri-Rigg prevents the commonplace snapping, shifting, and scratching that comes with using bungee cords and other ad-hoc securing methods alone. The setup is virtually instant. Strap the wrap to the object you want to lock in place or onto a holding surface. There are two types: the eye-hook and the j-hook. Both hold and attach to nearly anything. 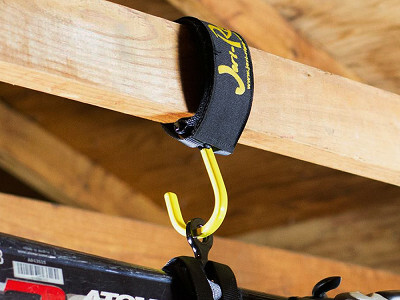 Use them as an anchoring point in conjunction with tie downs (e.g., bungee cords, tie down straps, ropes, chains)—or use the j-hook by itself to hang things. From home to your truck, camper, boat, or anywhere else, this securing system is a steady, handy helper. Hi Everyone! I am Jerry Hill, inventor of a great new product for transportation, organization, and storage called the Jeri-Rigg. It makes securing your items quick, easy, and safe. 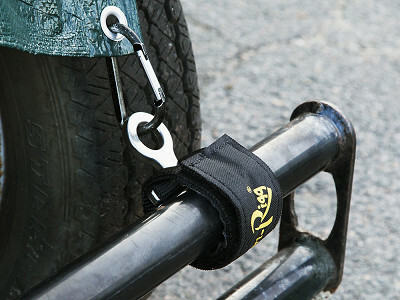 If you own a bungee cord or tie down strap this product is for you. These look like they will be an awesome gift idea for my boyfriend who has tons of toys that he needs to haul around. Neat! Your right, there are so many things that the Jeri-Rigg can be used for. I think of the Jeri-Rigg like one does with duct tape. You always want to keep a supply around because you find uses that you never thought of before until you need it. 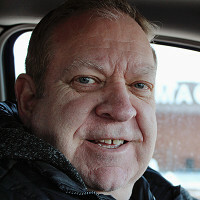 @Jerry I am about to purchase $1000+ for tie-downs for a 1400-lb (dry weight) camper for my 1/2 ton pickup. Do you think I could use the Jeri-Rigg for that purpose? Sure would make my life easier! Weight you listed is within the working load limits of the Jeri-Rigg. I would need to know exactly what you are wrapping the Jeri-Rigg around to accurately answer you question. remember the Jeri-Rigg is intended to wrap around an object and then use a tie down strap to attach to the Jeri-Rigg. If it works it certainly will make your life easier. Jerry, like the product concept and can see a lot of uses for it but does it have any adjustability for the diameter of what you are attaching it to? Looks like the slot in the belt allows for some diameter differences but not a lot. I'd like to buy a few but what size do I need for what diameter? The Jeri-Rigg does have some adjustability. The SS -Small Short is designed to wrap around a 3/4-1 inch object, the Small Medium is for a 1-11/2 inch object, the Medium for a 1/1/2-2 inch object and the Large Long is designed for a 2-3 inch object or a 2x4. That all being said a friend transported his motorcycle from Sturgis, ND to Minneapolis, MN using the Medium size wrapped around the 1 inch handlebars of his motorcycle. Although there was a gap between the handlebar and the strap because the Jeri-Rigg was under tension it transported it just fine with no loosing or shifting of the strap or motorcycle. Can you tell me the difference in the size of the J-hooks? For example, if I needed to place the J-hook itself around something thicker than a closet rod, I'm wondering if I would need the large size. The Large J hook is designed to wrap around a 2.5-3 inch object or a 2x4, The small long is for a 1.5-2 inch object and the Small Medium is for a 1-1.5 object. If in doubt I would go with a larger size than a smaller because even if there is a gap between the strap and the object you are wrapping it around it will still hold fine. Remember I want you completely satisfied so if the strap you order doesn't fit you can always exchange it for another size. This might be complicated but it could work. You might try to put 4 of the large long J hooks on a 2x4 with two facing up and two facing down in the opposite direction. Attach the hooks to the tailgate (with the tailgate up) and then attach the other two J hooks to the handles of your garbage can. If the J hooks don't quite reach the handles you might put 2 of the eye versions on the handles of the garbage can and then hook them to the J hooks. Another way would be to put 2 of the J hooks on the tailgate and thread a bungee cord through the strap (you are actually wrapping the J hook around the bungee cord) and then attach the bungee cord to the handles of the garbage can. Y0u could also use cabinets attached to the eye straps to attach to the J hooks if you need more length. I know this seems complicated but with a supply of Jeri-Riggs you can use a combination of them to solve most any problem.